In which G.M. Norton possesses a piece of Victorian history. As I've rambled on in previous periodical entries, I have a particular fondness for the Victorian era. It all began poring over Sherlock Holmes stories, which then led to reading about real-life crimes from Jack the Ripper and Dr Crippen (Holmes writer, Sir Arthur Conan Doyle attended his trial). Rampley & Co have recently released a new collection of pocket squares, based on pieces from the Victoria and Albert Museum in the Big Smoke. 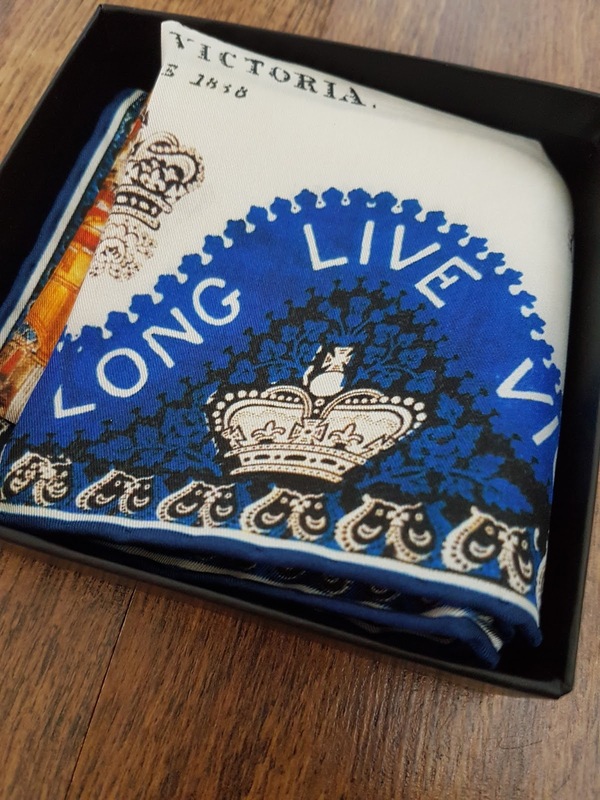 They very kindly offered to send me one, so I was naturally drawn to their Long Live Victoria square, which is a faithful reproduction of a silk hanky that was made to commemorate the coronation of Queen Victoria. The inscriptions read 'Long Live Victoria Queen of England', 'Coronation of Her Most Gracious Majesty Queen Victoria, June 1838'. It is a beautiful and very striking design. 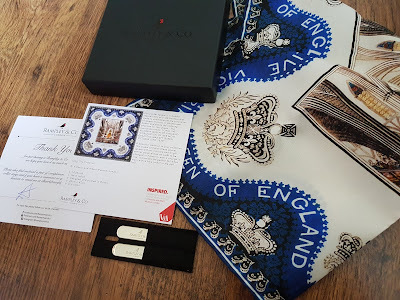 I feel enormously privileged to now have the chance to wear a copy of an original silk handkerchief that was designed 179 years ago. That's quite something. 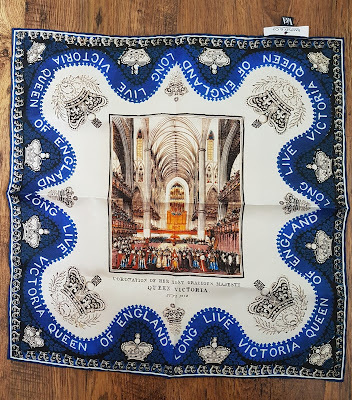 The centre of the hanky shows the splendour of Westminster Abbey, where the coronation is taking place. There are some lovely colours, perfect to show off in the old breast pocket. The border is particularly attractive too, with 'Long Live Victoria Queen of England' snaking round in a wonderful swirl delight. 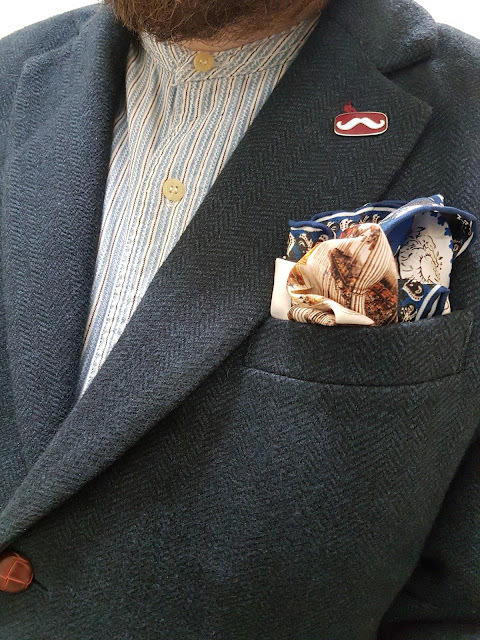 Rampley & Co are developing a strong reputation for recreating pieces of art onto pocket squares. I previously received a stunning 'eruption of the pocket' as the city of Pompeii was ablaze. I'm always whipping it out and showing it off to people and I'll be doing the same with this piece of Victorian history. The Rampley silk square is 42cm by 42cm, which is a very generous size. 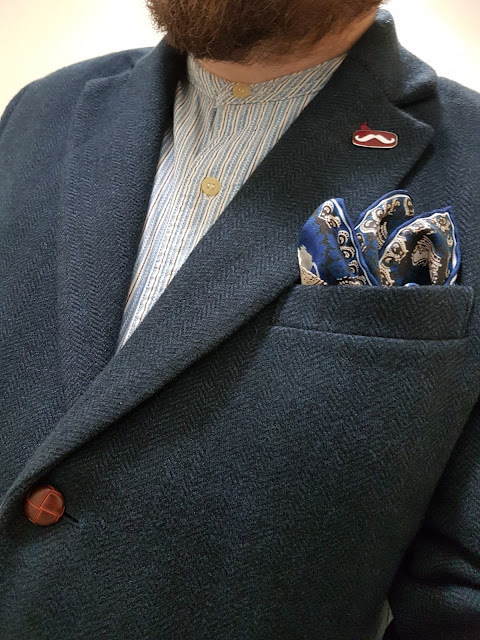 As one would expect from a company with such high standards, the square is made from 100% silk with hand-rolled edges, a true sign of quality for a luxury pocket square. 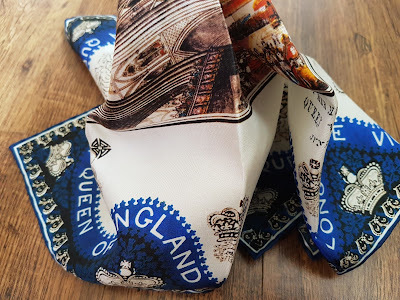 It's just a very British piece, which lends itself to all manner of folds. Priced at £59, it's super value. It arrives in a dark box, brandished with the Rampley emblem and comes with a pair of complimentary collar stays, as well as an information card. I always look out for what Rampley & Co are working on. 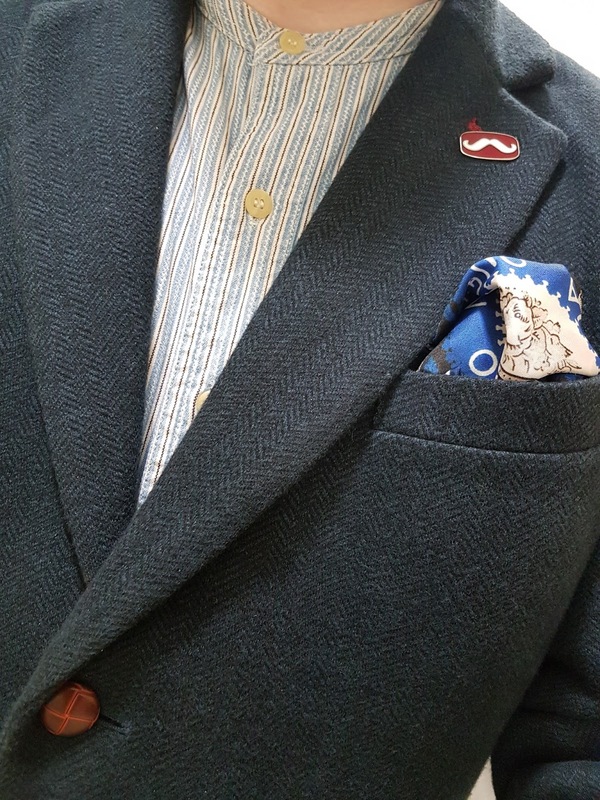 It must take enormous patience and effort to find the right piece of art that would work well as a pocket square. Then of course, it's getting permission from the likes of the Victoria and Albert museum to go ahead and produce it. I can only applaud those involved. Rampley are making art accessible and downright fun. 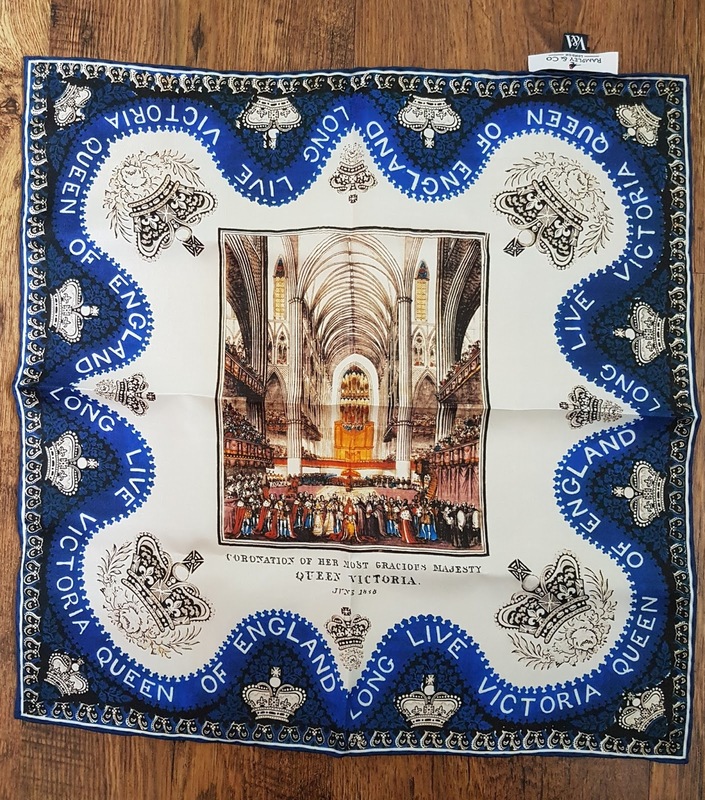 What's more, it's now made me really want to go and visit the Victoria and Albert Museum in London and marvel at the original silk handkerchief on display. Of course, it would rude not to wear my own silk hanky for my eventual visit. It's always such a lovely idea when they reissue something like this, it gives a new generation a chance to have a piece of history. Very nice indeed! I quite agree! I've already suggested an idea with the Imperial War Museum but these things can take an absolute age to sort out.